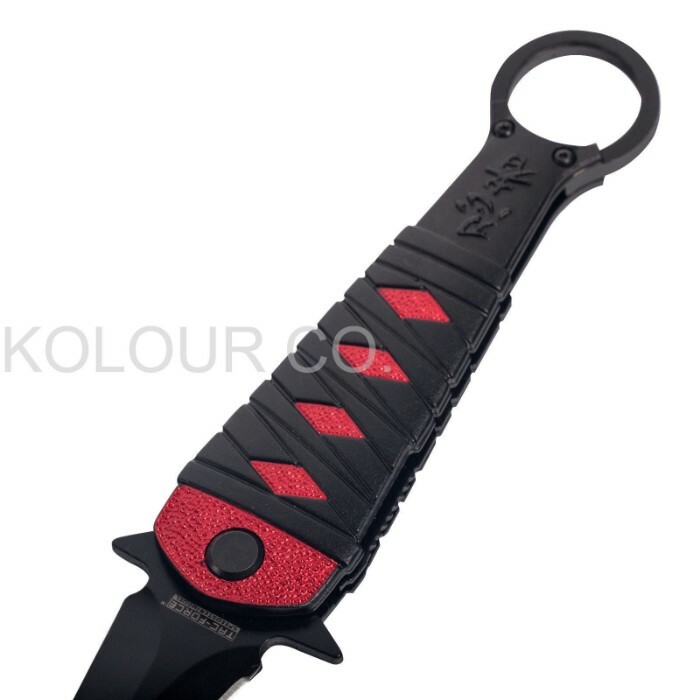 Tac Force Assassin Fold Assisted Opening Pocket Knife - Dagger Blade, Finger Ring - Red and Black | BUDK.com - Knives & Swords At The Lowest Prices! Part dagger, part throwing knife, part pocket knife, the Tac Force Assassin Fold is a veritable Frankenstein of knives. It's a ferocious monster, anyway. Gracefully sleek and beautifully streamlined, the Assassin Fold is no hideous freak, to be clear. It boasts a bitter stinging 3 1/4" stainless steel spear point blade with elegant beveling and alluring lines. 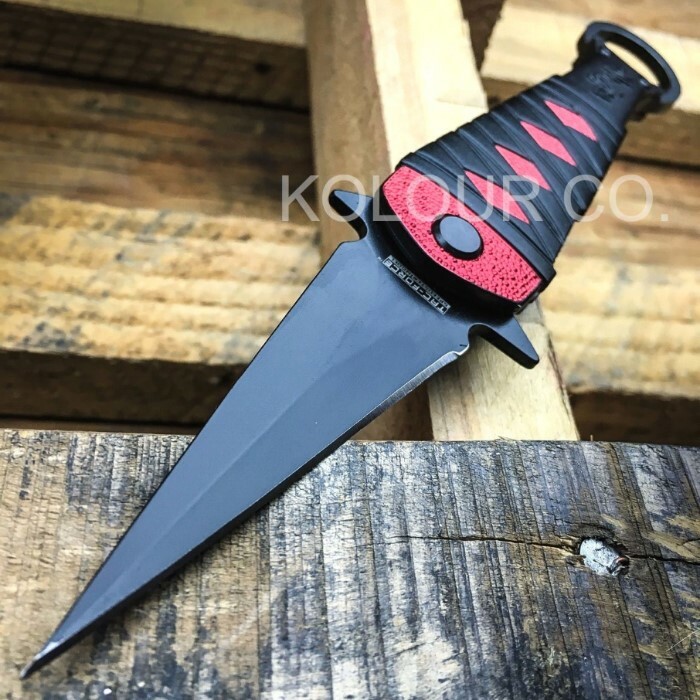 The ultimate assassin's blade, it's coated in a discrete, nonreflective black coating and easily deploys with one hand - quickly, smoothly, silently. Gently tug the handy flipper, and the exclusive "Speedster" assisted opening mechanism springs into action, dispatching the blade in a near-instant streak of black, like a ghostly shadow in the night. 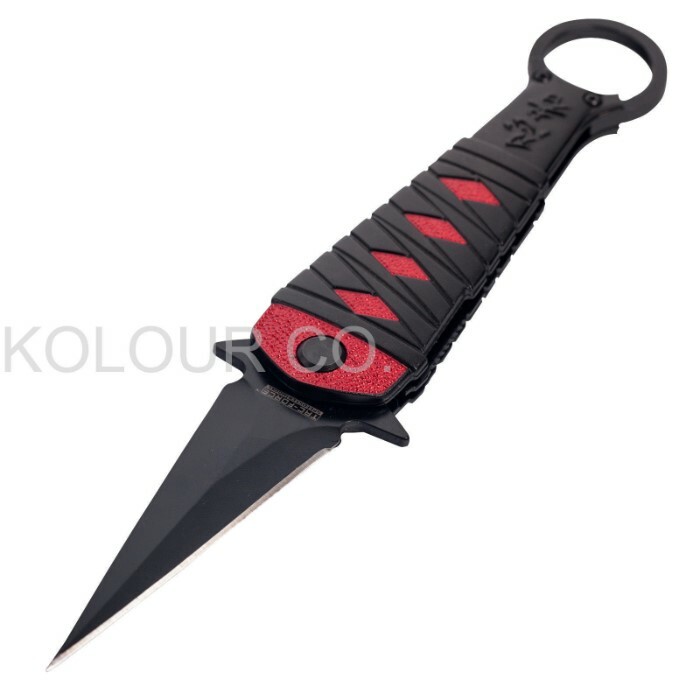 The Assassin Fold's aluminum handle features a chic wrapping texture colored a brooding black. The somber matte black beautifully offsets the textured metallic red background. A generous finger ring accented with stately kanji allows for unique knife manipulations, including launching the Assassin Fold through the air like a throwing knife. A pocket knife-turned-projectile weapon - what more could you want? The Assassin Fold throws in a handy pocket clip for good measure, a reminder that, despite its unusual profile, the 5 1/2" (closed) Tac Force Assassin Fold is still a pocket knife at heart - a remarkably versatile, extraordinarily capable everyday carry.